Låsby Sea Park is a small climate adaptation project combined with significant citizen involvement to meet rainwater management and recreational needs. On Christmas Eve in 2013, Låsby was hit by heavy rain, flooding the local nursing home with 5.5 million liters water. Låsby is located lower than its surrounding territories, meaning that all rainwater in the region ponds in the city during cloudbursts. In Skanderborg Municipality, such risk has been tackled with optimism. Through a comprehensive citizen consultation, 900 ideas for how the vulnerable area can be climate-proofed have been developed. 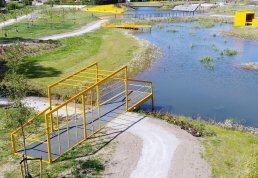 Based on citizens’ demand for active recreational spaces around water, the municipality has built a sea park (Låsby Søpark) with rainwater reservoirs, which can accommodate heavy rain. Located on an old industrial site, the rainwater reservoirs are designed to look like natural lakes with a permanent water mirror. Here, all water flowing towards Låsby from the 250 hectares of surrounding fields is retained and drained, thereby protecting the 2,000 citizens in Låsby against increasing flood risks. Låsby Sea Park is an example of successful and valuable citizen engagement. What was initially a project to create a lake for rainwater drainage has become a local hotspot for sports lovers, while all residents can enjoy passing their time in the park. At the core of Låsby Sea Park is life and activity, with a playground, skating area, a beach volleyball court and CrossGym training equipment. Climate adaptation and exercise go hand in hand at Låsby Sea Park, which attracts yoga practitioners and crossfitters. The project manages water throughout the entire rain cycle - from downpours in the surrounding areas to rainwater collection in and around the city for recreational use. Låsby Sea Park contributes to mitigating local cloudbursts, which has previously been a major challenge with significant health- and economy-related consequences. Låsby Sea Park strengthens the city’s resilience and adaptability to increasing climate risks and natural disasters. Skanderborg Municipality is a municipality on the Jutland peninsula in central Denmark.